If you want to convert PDF document into HTML files to uploaded them to your website without retyping or reformatting, PDF to HTML Free is the tool that can help convert PDF to HTML webpages for fast online publishing. 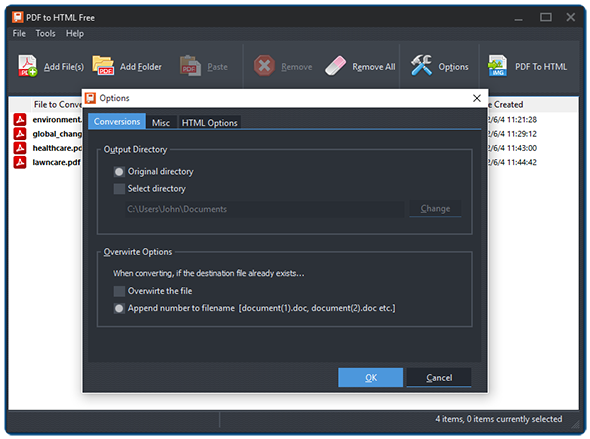 Launch PDF to HTML Free and click “Add File(s)” or “Add Folder” to add PDF files you want to convert. 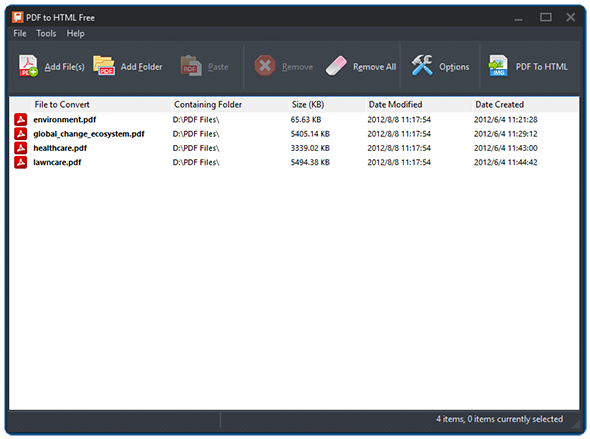 The files will be listed in the window with total number displayed at the bottom of the program. To delete one or all of them, click “Remove/Remove All”. Click “Options” to specify the conversion settings. In the “Conversions” tab, you can select the output directory from original directory or check “Select directory” and click “Change” to choose the directory you want. You can also set the overwrite ways when the destination file already exists. In the “HTML Options” you can define all pages or a continuous range to convert. The “Preserve Images” are checked by default. You can choose the ways to preserve from “Include image in HTML” and “Save images to the file system”. The quality for images can be set from 10 to 100, and 100 is entered default. The title of the converted HTML documents can be named using the filename or customized by yourself. Click “PDF to JPG” to start conversion. Within seconds, the conversion will be completed. 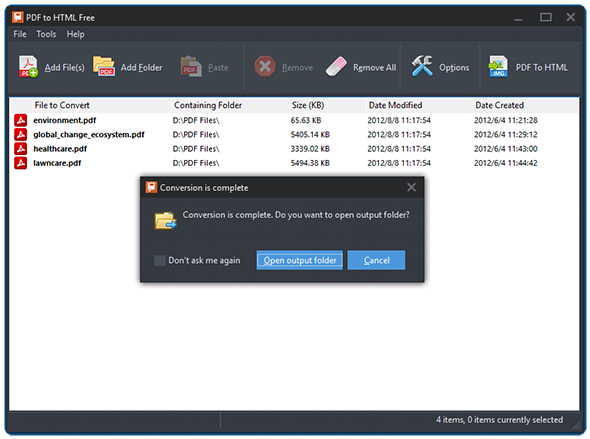 Click “Open output folder” to directly find the converted files.